According to the Digital Skills Committee, the UK faces a critical skills shortage in the technology sector. Chaired by Baroness Morgan, the Committee’s 2015 report called for action, showing that up to 20% of the British population have never used the internet and that more than half of the country’s IT teachers did not have a post-A-level qualification relevant to IT. A simple piece of coding hardware launched by the BBC and its partners called micro:bit promises to address the issue. Measuring just 5x4 cm with two programmable buttons and an array of 25 LEDs, the micro:bit is a pocket-sized computer that lets anyone code, customise and control devices like smartphones, computers, Arduino and Raspberry Pi. The gadget also has a built-in compass, on-board motion detector, Bluetooth and five input and output rings, and can be programmed using a range of coding systems, from the simple Blocks, to more advanced languages like Java and C++. A spiritual successor to the BBC’s Micro computer launched in the 1980s to help schools teach coding, the micro:bit is 70 times smaller and 18 times faster, and has been given free to one million Year 7 pupils across the UK. The original Micro produced a generation of programs that work in computing today, and the BBC hopes that the micro:bit will inspire a new generation to code. The project is already reaping benefits. Katie, a Year 7 pupil from Rishworth, West Yorkshire, designed a script that enabled the micro:bit to be sent into the stratosphere, taking digital images to chart its journey. Sounds exciting? 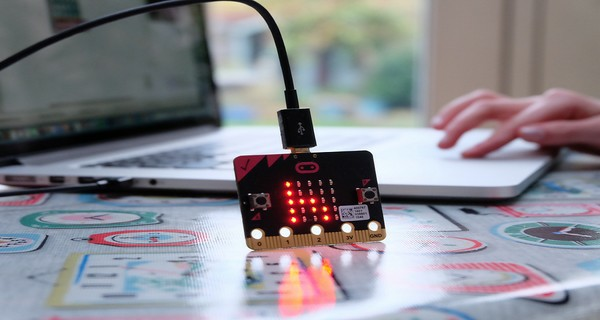 If you’re not a Year 7 student but would like to try your hand at coding, the BBC will soon make the micro:bit available to buy online for just £13.